It's not just a trench or a peacoat... it's both. I like the belt and the length and will be stalking it in my local store when winter items begin getting marked down. In real life, it's long sleeved. (Who rolls up coat sleeves anyway?) And it's soft and would look great with a bright scarf. How fancy would this look with a cocktail dress? 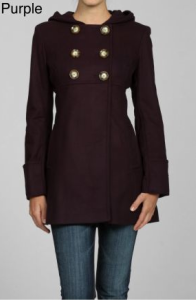 I like this coat (especially for $39) and it would be great for weekends with jeans and tennis shoes.